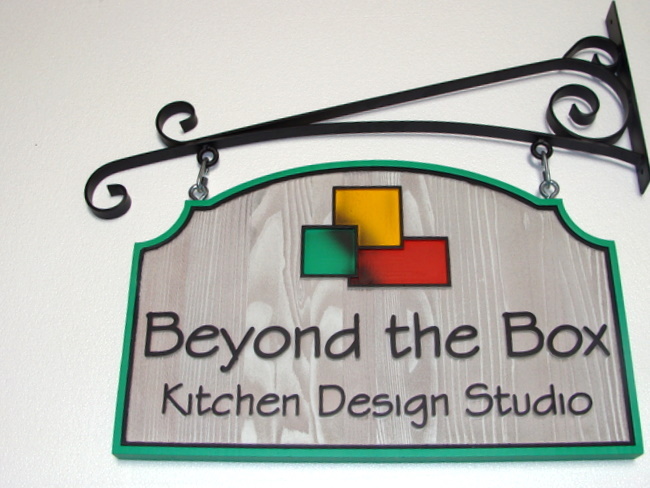 Above is a design for a carved double face projecting sign carved from Cedar wood for the "Beyond the Box " Kitchen Design Studio. The text, border and artwork are raised and the background is sandblasted to show the wood grain. The sign is painted with long-lasting automotive-grade enamels and clear-coated twice, making it suitable for all-weather outdoor use. The sign is hung from one of our wrought iron scroll brackets with quick links. Gallery 4 shows other scroll brackets.